Fall is just around the corner. I know this to be so because all the fruit has been picked from my fabulous fig tree. And no more await to ripen. This was a wonderful fig season, the best we've ever had. Actually, the only real one we've ever had since this is the first year the tree produced more than a handful of figs. I lost count but believe there were well over 120 figs from our one tree this year. 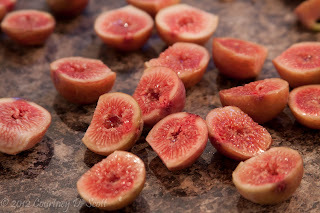 Now that my fig tree actually produces enough figs to notice, I have been reading up on figs, fig tree care, and fig tree propagation. I now know what a breba crop is and how it is differentiated from the main crop. I now know when to prune my colossal fig tree. Now that the harvest is done, I must wait for my tree to go dormant so I can snip of select branches and prepare them to go forth and multiply. I have visions of a fig orchard taking over the flat grassy expanse of my children's backyard haven. They don't really need all that room to run. Through all my internet research, I have found that there is quite a fig cult out there and am thinking of joining. 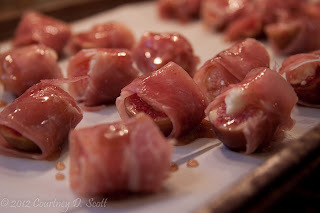 So while I wait for the dormant season to arrive and my cult membership to be approved, I'll remember fondly another recipe I tried with my oh so yummy figs. You'll remember my first culinary fig foray was the sweet baked treat, the Real Newton. 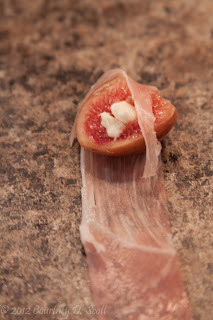 My second endeavor was sweet, savory and salty - the prosciutto wrapped fig. 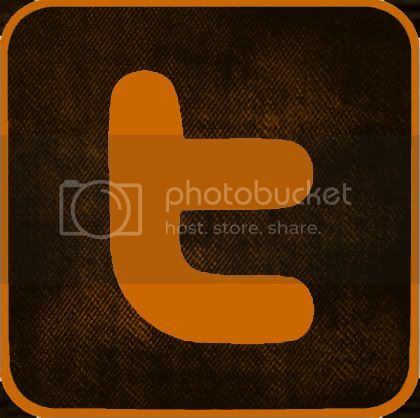 Here's how it is done. While waiting for the oven to preheat to 400º, slice about ten small figs in half. 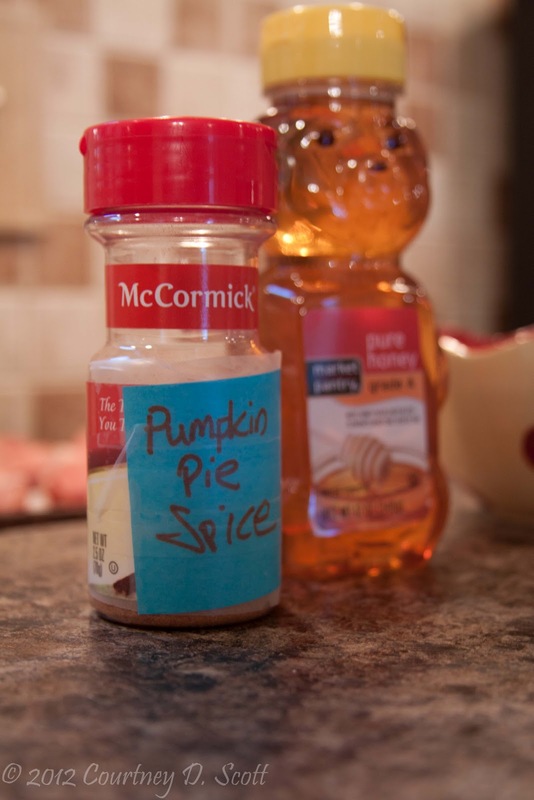 Once all the stuffing and wrapping is done, whip up a small bowl of 3 TBS honey and 1/4 tsp pumpkin pie spice. You can buy pumpkin pie spice but this particular version is a creation all my own. I cannot find the recipe and honestly cannot recall the balance of ingredients. And my packaging could use a little work. 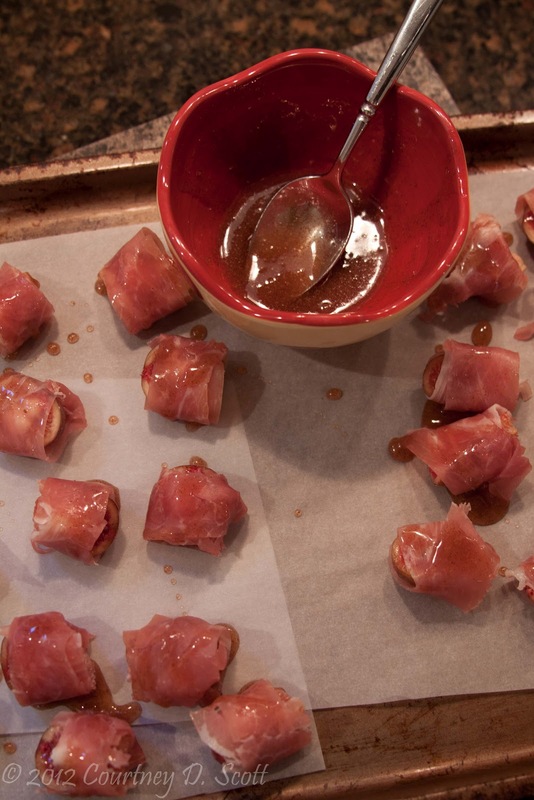 On a baking sheet covered with parchment paper, drizzle the honey concoction over the wrapped figs. Roast at 400º on top oven rack for about 8-10 minutes. This is the before-roasting picture and sadly there is no after-roasting picture. I missed that shot because I was too busy stuffing these delicious little morsels of sweet, savory, salty joy right into my face. Further, I had to literally fight my husband, my sons and our guests away from the appetizer plate as I placed it on the table. I barely got seven before they were all gone. There was no way I was getting the after picture.